In my defense, it wasn’t entirely a silly question. I was expecting (for whatever reason) to see a diner called “Rose’s” or “Rosie’s.” Instead I had located the Millerton Café. So going strictly by signage, I wasn’t sure at all that this was our intended destination. By all other accounts, it was the right place simply because there was no other place. You could stand in the parking lot and see the outskirts of town in all four directions. There clearly wasn’t another place to eat unless perhaps you were family stopping by to check on Aunt Ellie, in which case she might rustle you up a sandwich. 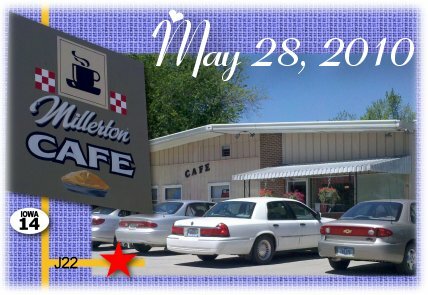 Besides, the spot we were looking for was supposed to be “the best place to eat in Southern Iowa,“ and the parking lot of the Millerton Café was packed when we arrived. (I daresay this town of 48 people probably triples in size every day between 11 a.m. and 1 p.m.) A good sign, even if it was the wrong place. So on the Friday of Memorial Day weekend, we left around 10 a.m. and headed south, collecting Garry & Shirley in Carlisle. A quick jump down Highway 5 took us to the Palmyra Road (S23), which is a lovely piece that gets you down to Highway 92 in about 20 scenic minutes. We jogged back west on 92 and picked up S23 again heading south. This is a county road which happens to make judicious use of the “pavement ends” strategy of way-finding. By this I mean that a sign warns you that “pavement ends” and you should therefore plan to take the sharp turn called “your only option” in about 10 feet. I think there were three or four of these along S23 and each time they’d leave me wondering if I was still on the right road. 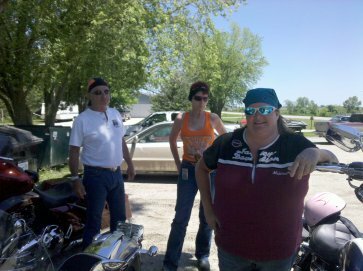 We took S23 to State Highway 34, then with DETOUR and ROAD CLOSED signs blaring all around us, we turned toward Chariton anyway and got lucky: the road did close, but gave us one final turn-off at the edge of town that dropped us at Casey’s for a potty and beverage break. From there we took a short loop through town and picked up Highway 14 heading south. (This, by the way, is a HORRIBLE stretch of road that will shake your teeth loose.) The turn-off to Millerton was County Road J22 – a peach compared to 14. Lunch was very good. The homemade hot beef sandwiches were excellent. I don’t think the chicken tenders were homemade, but they were still okay. But the real prize was dessert: Legend has it that Grandma comes in every morning to bake fresh pies. And not just apple and cherry. Every day there is fresh pecan, several types of berry, chocolate, sour cream raisin, banana cream, and much more – about 12 or 16 varieties, I think. The pie was amazing, and by itself worth the trip. After lunch we took 14 back up to 34 east, which got us quickly to C&C Cycles. 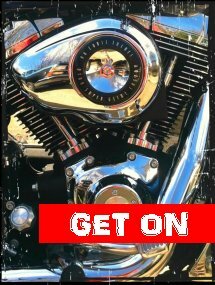 C&C is a multi-brand dealer selling Harley Davidson, Yamaha, Kawasaki, Suzuki and Polaris vehicles, parts and apparel. 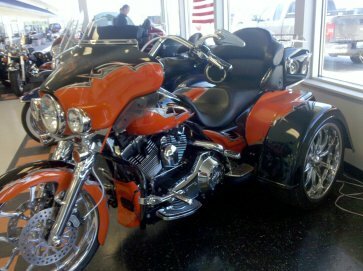 They also must sell a really versatile trike kit, because the entire front showroom was filled with about a dozen or more trikes made from a wide range of motorcycles. We shopped a bit, then it was time to head back toward Des Moines. For the trip home we took 34 west to Highway 65, which eventually joins with Highway 69 and takes us into Indianola. Other than a couple of impatient drivers (one of whom got to carefully study the middle finger of my left hand as he passed us on the two-lane), it was a gorgeous day of bright blue skies, summer temperatures and low humidity. Only thing that would have made it better was if Millerton had had a white-sand beach, clear azure water, and cabana boys selling umbrella drinks along with the pie. Oh we do miss those cabana boys! It was a great ride – topped off by another one today. 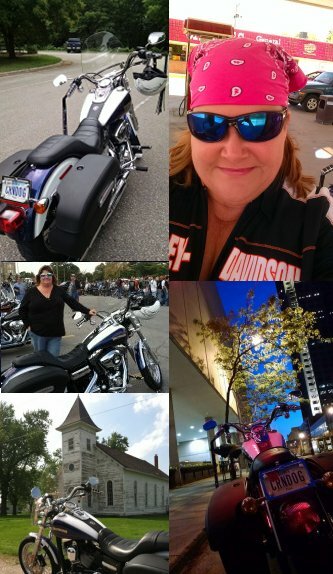 Love having good friends to ride with.